"Present" redirects here. For other uses, see Mouse of Winter Present. The Present Mouse is an Event Mouse found during the annual MouseHunt Birthday, Lunar New Year, and Great Winter Hunt events. Lunar New Year or Great Winter Hunt location Charm: ?? 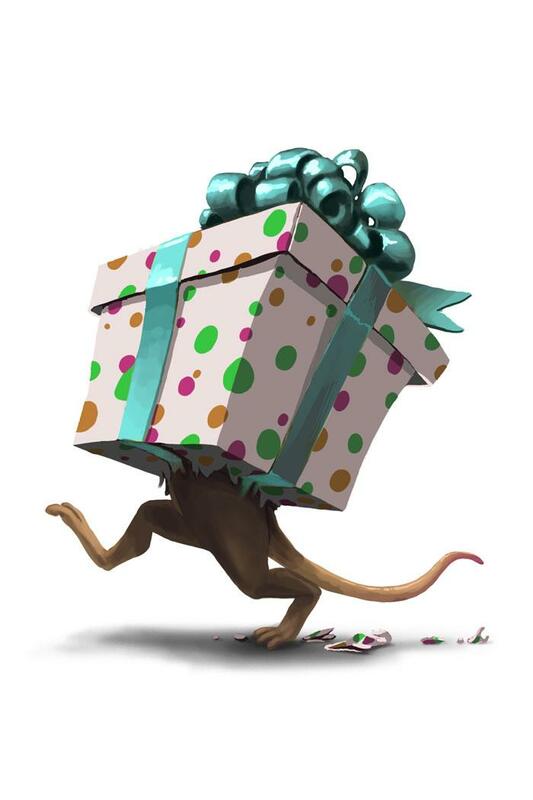 Information on how to locate and capture the Present Mouse can be found on the current MouseHunt Birthday, Lunar New Year or Great Winter Hunt location page. The original image of the Present Mouse features a gift tag "To: Larry ♥". When this ambitious little cheese-nabber decided to burrow his way into a Christmas present, he spent about five seconds being proud of himself for coming up with an ingenious diguise. He spent the next ten seconds figuring out that without eye holes in the box, he would end up running into walls and stepping on ornaments. Then he spent the next twenty minutes wishing that he hadn’t picked a box with a novelty trap in it. 3 December 2009: The Present Mouse is released and begins dropping Icing Sugar as loot. 13 December 2009: The Present Mouse begins dropping Two Festive Mitts as loot. 20 December 2009: The Present Mouse begins dropping Nine Reindeer Antlers as loot. 2 March 2010: The Present Mouse begins dropping Timeout Hour Glass in the Town of Gnawnia as part of the MouseHunt Birthday II event. 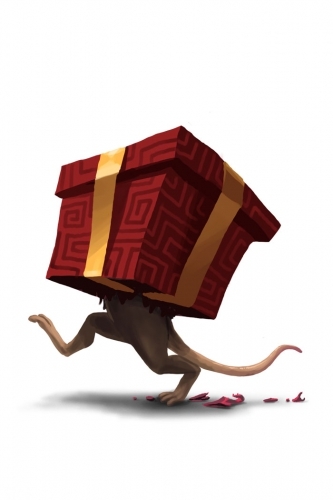 7 March 2010: The Present Mouse begins dropping Stolen Birthday Gift as loot in the Town of Gnawnia. 21 March 2010: The Present Mouse begins appearing in the Great Gnarled Tree. The Lunar New Year is a time for gifts and feasts, and this little mouse has managed to find his way into both! A finely wrapped gift containing many rich sweets has this mouse rather occupied inside. Being that most of his senses are occupied by the inside of the box, he is using sound to navigate the world outside and he seems to avoid the extremely loud fireworks. It is rumoured that a few of these packages have Nitropop potions hidden inside. This page was last edited on 9 April 2017, at 01:43.